Keeping the dog away from the cat’s food is important for your cat and dog health. 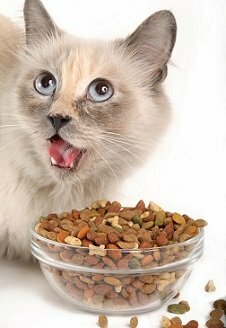 When dogs eat cat food on a daily basis they are subject to digestive issues and lack of proper nutrition. Dogs eating cat food regularly get fat and experience vomiting and diarrhea. The cat also eats less food which poses a risk of malnutrition of your feline, even worse if you have a kitten. Cat foods are nutritionally different than dog foods and are meant to satisfy a completely different set of nutritional requirements. Cats need more protein and fats, while dogs don’t. Some amino-acids such as Taurine are crucial for cats, but dogs don’t need it. Cats don’t need much carbohydrates but dogs do. Each food satisfies different nutritional needs for each specie. If you don’t want your dog to have serious health issues in the long run and if you don’t want your kitty to experience nutritional deficiencies, you must stop your canine friend from stealing the cat’s food. If you free-feed your cat the food will be sitting in the bowl because most cats don’t eat all the food at once. They eat as they spend energy throughout the day. This is a situation that allows the dog to steal the food from the cat. You can stop this with a selective automatic feeder, such as the SureFeed or the Wireless Whiskers. 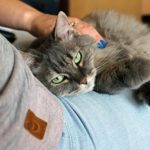 The SureFeed Microchip feeder allows you to feed your cat dry or wet food and it works with a sensor that opens when in contact with a collar tag the cat wears (or microchip implant). The dog simply won’t be able to eat from this feeder. 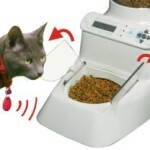 The Wireless Whiskers cat food dispenser is a gravity feeder that features a food bowl with two small transparent doors on top that block the food at all times, only opening when sensing the cat’s collar tag. This means no pet without a collar tag can have access to the food. The two small doors also block the food when the cat has reached its daily food intake. This way you can block your dog from eating the cat’s food, and put your cat on a diet at the same time. This solution takes advantage of the fact that cats can jump up high while dogs can’t. Look anywhere in your house where you can place the cat’s bowl high where your dog can’t access. An excellent idea is getting a wall-mounted cat dinning table. 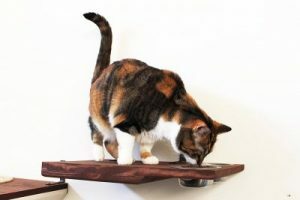 CatastrophiCreations offers a very nice handcrafted wall-mounted feeder shelf where your cat can jump on and eat at anytime without the stress of a dog trying to steal its food. The shelf comes with the brackets to mount it and two stainless steel bowls that get inserted into the holes of the shelf. Suitable for most cats, this dinning shelf has been tested up to 85 lbs. Check more details of this great idea here (affiliate link). This solution is suitable to keep away dogs of any size. 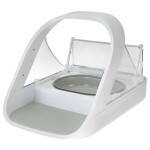 Enclosed feeding stations are a very good solution to keep your dog from eating your cat’s food. You can buy a cat feeding station or create your own. 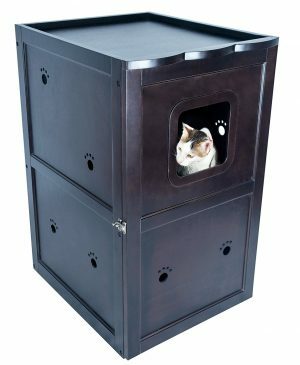 The Feed-Safe cat feeding station is like a dome with two small doors, with a entry and the exit door so your cat doesn’t feel trapped. You place the food bowl inside of it and your dog can’t enter the dome. This solution is suitable for large dogs since small dogs still could stick their snout in it. Another good option is buying a cat enclosure to set up a feeding station. A cat enclosure can be a regular cat house or a litter box concealer. Regular cat houses work well to create a feeding station, but they are usually on the small side. If you have a small cat this is your option. Just make sure the entry door is small enough that can block your dog’s nose. Litter box concealers are usually larger and look like a piece of furniture, which is a bonus. 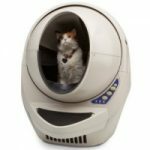 I particularly like the Petsfit Pet House that features a double-decker interior with a small door to access the top “floor”. The interior top panel features an opening that the cat accesses to get to the bottom “floor”. The food bowls can be placed on the bottom “floor”. This is a good solution because the dog won’t be able to see the cat food through the door. In case your dog eats the cat’s poop you will have to set up two cat enclosures: one for the little box and another one for the cat food. 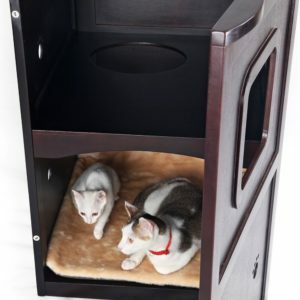 If this is your case and since you can’t put together the litter box with the cat food (I don’t recommend it), consider this option only if you have enough room to place two stations. To process to create a cat’s feeding station starts with choosing the enclosure you will use. You can choose any enclosure to do this, a big plastic container with a lid, a closet, a 2-door dresser, a cabinet, etc. The possibilities are endless. 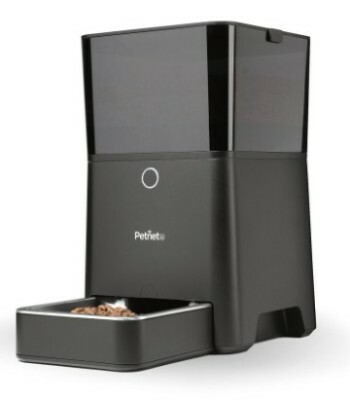 Once you choose the type of feeding station you want for your cat, you need to make an opening in the feeding station to install an automatic cat door, such as the SureFlap microchip that only the cat can open. By using a pet gate or a cat door you make sure your dog won’t be able to go to that specific room. 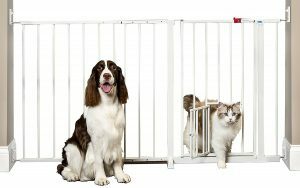 If you have a large dog (and your cat is a good jumper) you can get a baby gate which is made with stronger materials and they are taller than the pet gates. If your cat doesn’t jump that high, get a pet gate with a small cat door for your kitty to comfortably walk to the other room. Pet gates come with extensions on the sides to adjust to the right width. If you don’t have an area to install a gate in your house or if you don’t want to deal with gates you can install a cat door. 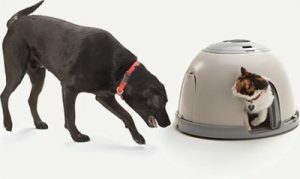 This solution will stop the dog and will give your cat access to any room you decide. You can install a cat door in any door in your house, closet, bedroom, garage, etc. There are also cat doors that can be installed in glass doors (patios, laundry rooms, etc. ), and even on windows. Once you decide where to install the cat door, make sure that your door or window will be closed at all times. 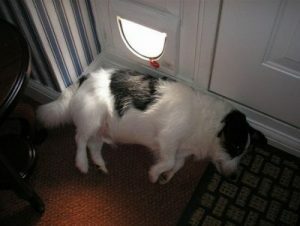 If you choose to install a regular cat door (that are more affordable), they have the disadvantage that a small dog can still make its way through it, or a large dog can stick its nose in the door and block it. With magnetic and microchip cat doors the dog won’t be able to open the flap or stick its nose in, it will be blocked because they work with a sensor or a magnetic field that only unlatches the flap when in contact with a magnet or a microchip the cat wears on a collar tag. The great advantage of blocking your dog from accessing a specific room is that you can keep your dog not only from eating the cat food, but also you keep the dog away from the cat litter box. This is also a good solution if you have multiple-cats. Consider your dog’s personality and age before choosing any option. Sometimes a small dog could be very stubborn and will require two separate rooms. With puppies the food requires a strong protection. 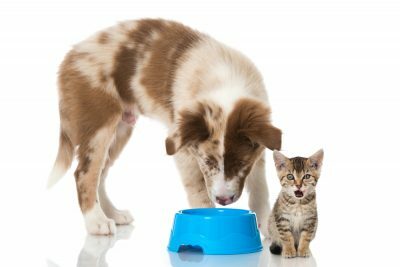 Keeping the dog from eating the cat’s food will protect your dog and cat from getting health issues in the future so it’s worth the effort. Good luck with this new project!